The Archie Fund in Aberdeen City raises funds for the Royal Aberdeen Children's Hospital. Money raised goes towards providing a welcoming and friendly environment for the care of children in Grampian and the North East of Scotland. Each year the Aberdeen Children's Hospital cares for over 8000 children who have to stay in the wards and over 51,000 outpatients at the clinics. The name ARCHIE comes from the initial for Aberdeen Royal Children�s Hospital Is Excellent and the Archie Fund Foundation Aberdeen was set up in September 2000 to help provide extras needed to help Make The Difference in the care of children. In the summer of 2007, July or August depending on the Buchan weather, the aunt and uncle of Siobhan Morrison will be releasing a boat in memory of their niece. Lisa and Gordon Morrison are reviving an old Boddam tradition called boaties where Boddamers would build their own traditional model boat and sail it in Boddam Harbour or at the Den Dam at Stirling Hill. In keeping with the Boddam Boaties tradition Gordon has built the boat himself, though adapted it to survive the North Sea. It is named Siobhan in memory of their niece. 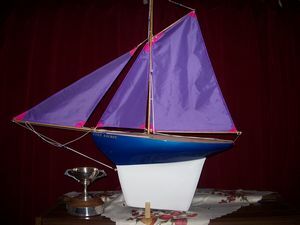 Lisa and Gordon will give this tradition a modern twist though, the sailing boat will be fitted with a satellite tracker (donated by mtsltd) with a battery that should last up to 16 days. This will allow the family of Siobhan and any supporters to track how far Siobhan's boat will sail. You can do this by visiting www.mtsltd.com and clicking on Live Demonstration at their website on the left hand side and then on the ID Siobhan. This will bring up a map giving you the boat's direction, speed and location. The battery for the satellite tracker is powered by a large motorcycle battery which has been donated by Halford's of Peterhead. Donations to the Archie Fund Aberdeen are invited. Siobhan Lynne Morrison was born on the 22 October 1995 and led a normal happy life in Cruden Bay with her mum and brother, always with a wonderful smile. She developed a form of cancer called Ewing's Sarcoma which she bravely coped with until she sadly died on the 24 October 2006 aged 11 years. 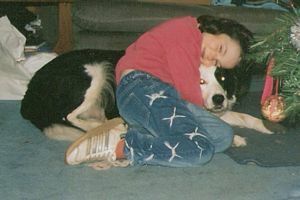 The photo on the left shows Siobhan enjoying her last Christmas and giving Nelson, the dog of Lisa and Gordon, an Xmas cuddle. Lisa and Gordon Morrison have set up a page on the online donation website justgiving.com at www.justgiving.com/sailboatsiobhan where they describe their fund raising event and where you can make an online donation to the Archie Foundation Fund, Aberdeen in memory of brave Siobhan. Donations will be collected by Justgiving and passed straight to the Archie Fund which helps children, young people and their families in the Royal Aberdeen Children's Hospital and the Community Child Health Services across Grampian. This enables these services to buy specialised equipment or to train specialist staff like nurses and doctors who would have helped care for Siobhan. The slogan of the Archie Fund Aberdeen is Making the Difference and the Charity Registration Number is No SC017296. UK taxpayers can donate an extra 28%, at no additional cost to themselves, by using Gift Aid. The sailing boat that will be launched on the Buchanness Coast beside Boddam Lighthouse sometime in July and August 2007. The launch date will be set nearer the time so that the best sailing weather conditions can be calculated to enable to boat to sail as far as possible. 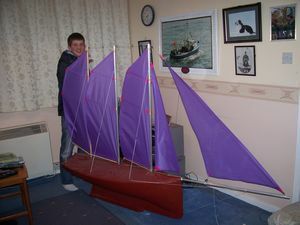 The Siobhan Morrison sailing boat is a 4ft 3 masted hand made model sailing boat and is pictured to the left. Individuals can make donations and add comments such as guessing how far the Siobhan Morrison Sailing Boat will sail in nautical miles. Sponsorship forms will also be distributed locally across the North east of Scotland and the Buchan area in shops and pubs. 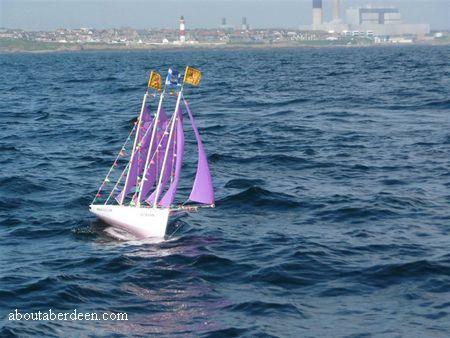 Sponsors are asked to donate �2 which gives them entry to a prize draw to win the two foot model sailing boat Lady Rachel which is in the photograph on the left. The winner will be the person who correctly guesses how far the Siobhan Morrison boat will sail. If more than one person correctly guesses the distance then the winner will be drawn from a hat. Collecting donation cans and sponsorship forms can be found at the Boddam Hotels and pubs of Seaview Hotel, Buchanness Hotel and The Rocksley Inn. Other shops and facilities in Boddam village that have the cans and forms include the Post office, Mace shop and the Chip Shop. In the nearby town of Peterhead the donating cans and sponsor forms can be found at The Royal British Legion Peterhead and the Halford�s branch in Peterhead. People can also write a message to Siobhan that will be sealed into the boat by Gordon. The easiest way to do this is to go to www.justgiving.com/sailboatsiobhan and write a message and after it write "in boat". Local companies can make donations and in return will have their company advertised on the sailing boat. Company's that make a donation will be able to have an advertisement on the vessel's topside's, deck or sail's, by way of a sticker on the boat itself after she has been sprayed white. Then lacquer will be sprayed over the stickers to protect it fro the sea and wind. Alternatively sponsors details can be painted onto the boat or a name can be sewn onto her sail's with different colour sail material by Lisa and Gordon. In return organisations and companies can benefit from the media exposure that the Siobhan boat is receiving from Aberdeenshire newspapers, radio, TV and internet channels such as AboutAberdeen.com, Wave's Radio, Buchan Observer, the Press and Journal, the Evening Express, Northsound, North Tonight and national coverage in media like the magazine Fishing News and Scottish newspapers like The Scotsman and The Sunday Post. Following the event and when a final tally of all funds raised has been reached Lisa Morrison plans to write a book about this experience. Her husband Gordon will be on hand to over advice. He wrote the Doric book Thi Lyfe An Tyme's O An Enshoar Loon. The Boddam couple hope to raise over �10,000 for the Archie Fund Aberdeen. The sailing boat Siobahn was launched into the North Sea off Buchaness Lighthouse in Boddam on Friday 24 August 2007. She made swift voyage as can be seen in the picture above. Follow her progress at www.justgiving.com/sailboatsiobhan where there is still time to donate money or buy a raffle ticket to guess how far she will sail. Further news about the progress of this Archie Fund Aberdeen fund raising event will be added to this page, at www.justgiving.com/sailboatsiobhan or on Peterhead Radio Station Waves Radio on the Kenny King show on FM 101.20.